The main problem with being late in discussing rereads is remembering exactly what struck me differently this time, as opposed to previously, and why I even felt like rereading that book. Here the whole string of rereads was probably a comfort thing, where I wasn’t in the mood for self-challenge, particularly. Not that these books aren’t thought-provoking, because they certainly are, about a whole range of issues, but at the same time I’ve read them a few times now and have been through those issues then. This time, what I think I was noticing was the theme of control in the two books. The first is largely about Taylor being a person who wants to make her own life in her own way, with careful planning and saving taking her to an adventure that quickly off her expected route, with the addition to her life of Turtle. Accepting that addition, and allowing for the huge change in lifestyle needed from it, while still taking charge of her own adventure is Taylor’s challenge. The second comes about four years later, when things are going pretty well for the two, and they have built up what seems to be a strong relationship of trust, which in a difficult way backfires on them as a good deed brings them to the attention of what could be the wrong people. Kingsolver’s gift here is to show us the many and very varied motivations of everyone involved, which are nearly all for what they consider the good, but still come out in decided opposition. Taylor does not react well to the rug being pulled out from under her, and in many ways it is the acceptance and wisdom of age which eventually overcomes the hotheadedness of two oppositely determined young women. Another reread of a fun children’s book, although I never actually readowned (I suddenly have a vague recollection of reading a friend’s copy, although I can’t be sure it’s correct. I certainly was the kind of child who’d go to a friend’s house and read their books (with permission), though!) this one as a child. I haven’t seen the Disney cartoon in decades (I’m only presuming I’ve ever seen the full film straight through), and I haven’t seen the more recent live-action version at all, but regardless of how good they may be, the book is good enough that it must be better! While there are stereotypes and exaggerations aplenty in the characterisations, there is also reality in both the dogs and the humans (not to mention a few other animals) and fond interaction galore. The story hangs together well and I enjoy going back to it. What I had actually meant for yesterday’s post (before I got philosophical) was to mention the other crocheting I did during my mother’s visit, which was to make a couple of dishcloths for her, after she expressed her surprise and pleasure at how useful they were. Well, as I’ve said/shown before, they’re a fun, quick and easy pattern to make, and easy to remember, so on our way out for the day next morning we stopped by the yarn store by the bus station and picked up a ball of cotton yarn she liked, and a crochet hook, which was unfortunately bigger than it should have been, as I was thinking of hooks I needed rather than of a hook for this project. 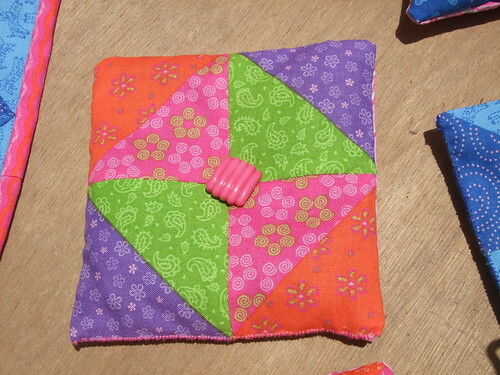 That means the cloth is rather looser than the ones I’ve made in the past, so it’s not really suitable for its alternate use as a potholder, which is how we tend to use them. However my mother specifically seems to like them as proper dishcloths, for washing dishes and wiping surfaces, so that’s probably okay. I got two cloths out of one ball of yarn (done thicker the second one might go into another ball, which is part of why several of mine in the past are two-tone), doing most of them on the bus as we travelled about. 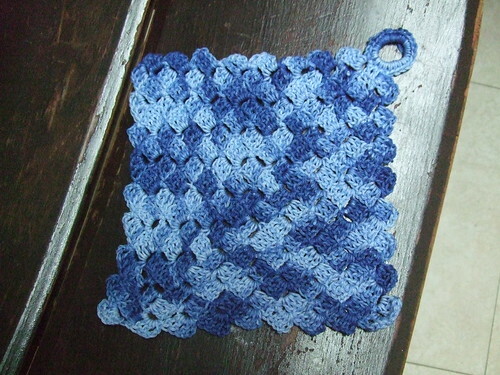 I suppose I should branch out and try some other dishcloth patterns, especially if I have more people converted to the idea of actually using them, but I do like this pattern a lot, so we’ll see, I suppose! I haven’t been thinking enough about the significance of the Nine Days, but so far I seem to have been unconsciously avoiding the questionable stuff anyway. We’re vegetarians anyhow, and we finally seemed to catch up on the laundry on Sunday, and to be honest I haven’t actually been crafting this week either (not that I’ve asked our Rav about the last, and from what I’ve seen online and heard in person there is a lot of variation in what people are told is good/bad to do in this regard). Still, though, avoiding such things should be for a reason, rather than just by default, so perhaps this afternoon I’ll pull out (at very least) The Book of Our Heritage by Eliyahu Kitov and reread the appropriate sections. Here’s the thing: being Orthodox Jewish in Jerusalem (especially living in a religious area in Jerusalem) is very easy in very many ways, but sometimes that makes it too easy to forget what we’re missing, all the aspects of Judaism that we just can’t do, that in so many ways we’re still in exile. This is far more philosophical than I generally get on the blog (or often enough IRL either), but if not now, when? Hm, apparently I’ve only previously reread this book once since beginning the blog, and that over two years ago, so I wasn’t pushing my luck this time after all. We still don’t have local copies of volumes 2, 3, or 4 of the Lymond Chronicle, so I might just skip over to 5 and 6 (it’s not like I don’t know the story…) for now. As my mother said when she was here, we appear to have a volume of Dunnett on every bookshelf (we’ve just started trying to organise the shelves after the move…), although it’s not like we have a complete set of Niccolos either. The rest of her books are on my “To buy when we have the disposable income” list, of course, presuming I don’t find them in any of the second-hand bookshops. Dunnett’s good enough that people don’t appear to dispose of her books, however. Once we do have them all I’m looking forward to my DH reading them, as this is one series I refuse to spoil, and I really want to talk them over with him and get his opinions. 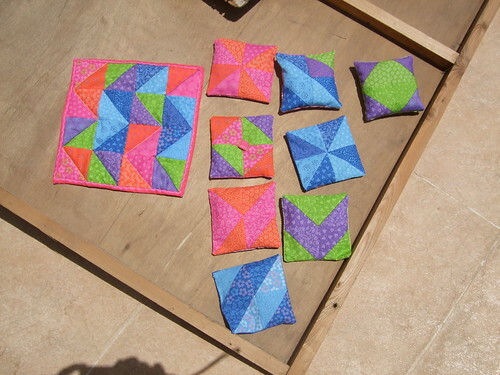 I’ve had the Klutz Patchwork and Quilting kit (by Barbara Kane) for a fair few years now, and never done anything with it, although I’ve kept thinking I should. What finally inspired me was not finding mothballs on sale for our sukka schach in the months between last Sukkot (which is an autumn festival) and our move a couple of months ago. The move made a good opportunity to clean off and better store our sukka and schach, and I did have a packet of loose herbal moth repellant from Fibrecrafts in the UK (although their website doesn’t list it any more) that I’d never used either, so I decided it was time to put all these factors together and make some patchwork moth repelling sachets! to be hidden away and possibly damaged in schach. I wasn’t so convinced, but decided they probably were a bit too big for the purpose, so I used some of the scrap white fabric to make some very small (and pretty boring) sachets (which I don’t think I photographed, unfortunately) for that, and was then left with half the kit, and half the moth repellant stuff. 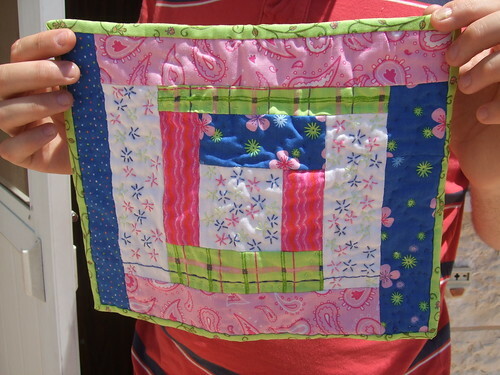 Improving my skills and trying quilting seemed the next step, so that’s what I did! 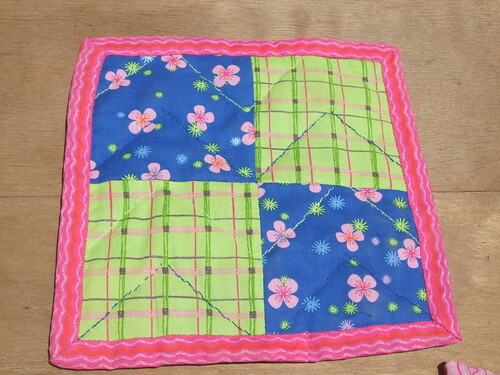 The actual quilting wasn’t difficult, what with following the diagonal lines on the front, but it’s when I came to my second quilted piece that I ran into problems. 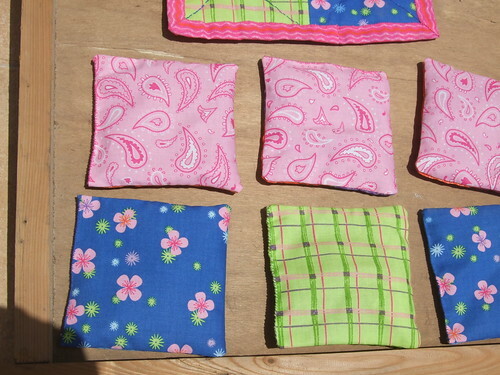 Before that I used up the rest of the kit squares and main backing pieces to make a couple more sachets (which ended up much fatter than the first few, since I had all that filling to use up – they are the two in the top right of the following picture). I didn’t worry much about the width of the strips, but just added them on as the length was right, while keeping the main colours reasonably spread out. 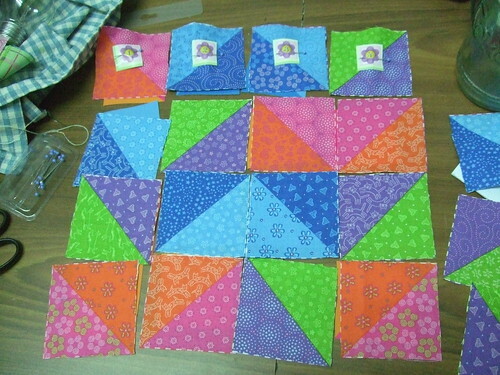 (I did join two shorter pieces for one of the blue strips.) 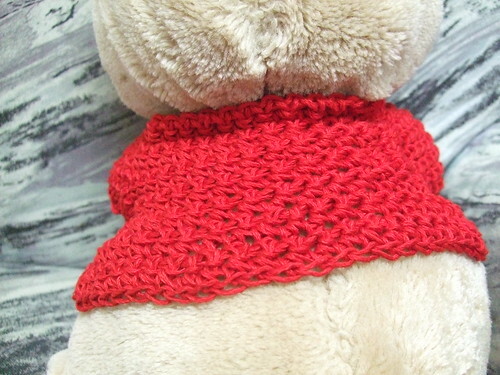 I stopped when I no longer had a choice of pieces for the front, which was just a little smaller than the washcloth (allowing me to cut off the seamed edges), and then cut a piece from the back of the shirt to fit. (Sorry I don’t have any progress pics.) 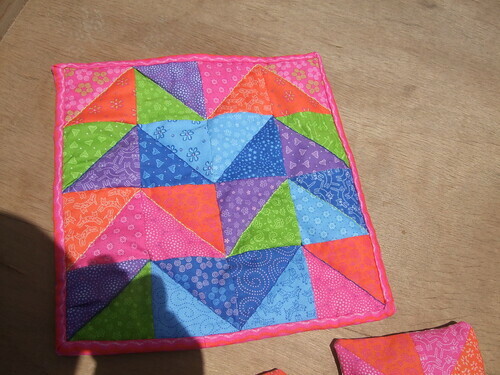 Then I started quilting. My personal opinion is that on the striped shirt backing, and with the border in place (the border which thankfully hides some of the mess around the edges) the thing looks like a toddler’s first scribbles on lined paper, which oh-so-proud parents have framed for posterity! 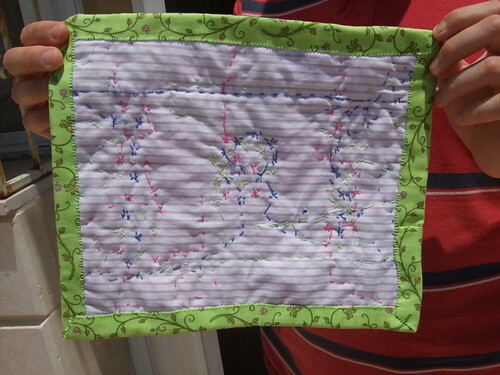 My DH and my mother (who visited last week) insist on being impressed with my handiwork anyway, but there’s no denying that while people treat the first tablemat as double-sided, you’re never going to think the back of this one as a potential front! 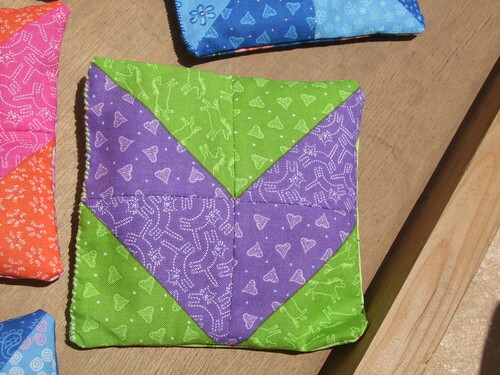 So definitely the next thing to learn in quilting is how to choose where to put your stitching, and that’s not something I’ve found online, although there are lots of great tutorials for everything else. Oh well, it’s a great excuse to trawl the (second-hand) bookshops for quilting books to add to my craft shelf! Well, my DH is feeling very inspired, so I figure if I write blog posts whenever he does it might actually get me somewhere! A few months ago we really got into playing Scrabble quite a bit, and then in one of our regular (ie pretty much whenever we pass them) perusals of the local second-hand bookshops we found this book from 1976 (which the author has since expanded and rewritten more than once, so far as I can tell) and had to get it. He interviewed the original creators, developers, manufacturers and early players of the game for a comprehensive and interestingly written history of it, and also has a long section on hints and playing advice. While much of the book is outdated, in that championships have by now long been formalised and so on, it’s a fun and fascinating book, that can be enjoyed by the casual player as well as the budding Scrabble champion. It seems (from what I’ve read online) to still be available in several library systems around the world, and is worth reserving, in my opinion. For all of us who create and use books, online media and more, knowing the basics of copyright law and protection is important. As someone who has worked extensively in libraries in the past, and hopes to do so again, I also find the topic interesting, so when I came across this comic strip/graphic non-fiction work from Duke University‘s law department, explaining (precisely for those of us who are online as consumers and/or producers) the basics of copyright and fair use (specifically in reference to US law, but with wider value) I really appreciated it. It’s well enough done to be worth a look even if you think you don’t care about this topic. Highly recommended by me! First, I can finally show you the baby blanket for my cousin’s first child (a gorgeous little boy – from the pictures, as I haven’t met him yet). This is the blocking shot, but you should be able to see more or less what it looks like. 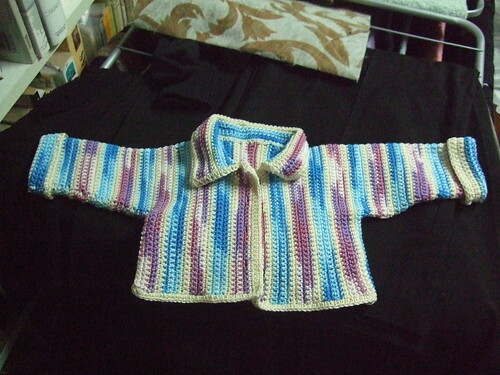 Second, a baby size jacket using up some assorted cottons (much of it leftover from the blanket above). 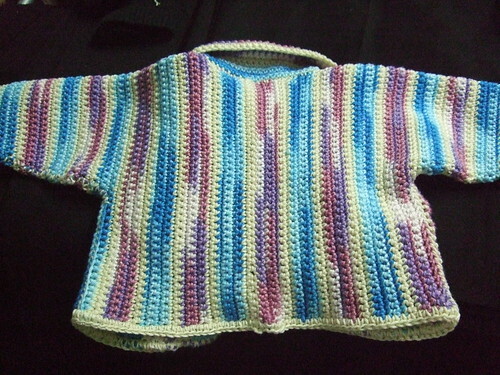 I suddenly realised that baby stuff is small and quick, and thus good practice for the skills needed to make clothing for ME!!!! (And there weren’t any other motivations at all, of course…) I got the cutest little buttons for it, but haven’t sewn them on yet. It’s done sideways, from each cuff, and then joined at the back, and since I didn’t precisely follow the suggested striping I was quite pleased with myself for working things out to get them to match up properly! I’m actually working on a second baby cardigan (this one with more seaming and set in sleeves, which latter I haven’t done before), but I’ve neither finished it nor taken pictures, apparently, so more on that later. 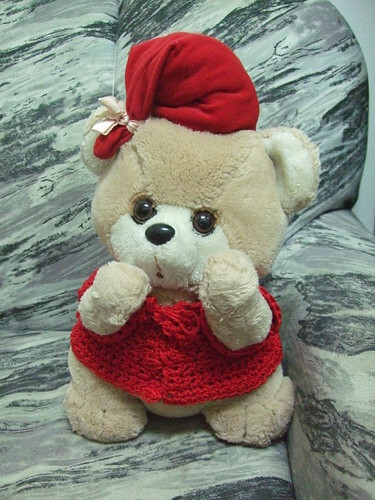 I have got pictures of the yarn used in that though, as I’d previously used it to make a new top for a teddy bear my DH has had since childhood. It was a perfect match for Sam’s hat, although I’ve had suggestions that the colour may be a bit harsh/strong for a young child. I suppose we’ll just have to see about that, however! I improvised the pattern as I went, and it called for some pretty extreme hip shaping, so I’m glad that worked out alright. 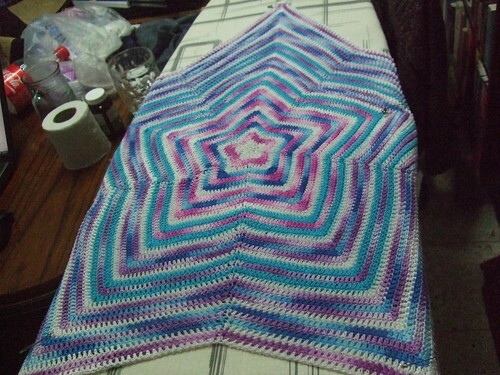 I’ve also finally used up the yarn from the first jacket I ever made (which I posted about at the time) to make a child sized triangular shawl, but apparently I don’t have pictures of that yet either. Obviously, I need to catch up on my photography as well as everything else! My lovely DH has apparently got bored of waiting for me to start posting here again, and has decided to go into book-blogging for himself. He’s crafting his first (introductory) post as I type, but I suspect he’ll be interesting. He’s planning on discussing classic literature (in the original languages, where that’s relevant, although he’ll be blogging in English) and Golden Age science fiction. I’ll let you know when we post about the same books, and hopefully this’ll inspire me to get back to discussing my own reading and crafting. After all, so far dating, engagement, marriage and now pregnancy (did I just admit that?! 😉 ) have been a major distraction from blogging and reading (and even from crafting, although somewhat less so, so it’s about time they started going the other way! Of course, the 2010 booklist is going to be (like last year) less populated than it should be, as I have lost track of some of the books I have read, but we’ll do what we can.